I’ve said it before, and I’ll say it again – San Sebastian has got to be one of my favourite places on the planet. With Michelin stars and Pintxos bars galore, the charm of the city’s Old Quarter (‘Parte Vieja‘) and a gorgeous city beach on its doorstep, it’s quite simply heaven on earth for any food and travel enthusiast out there. Ever since my first visit in 2011, I’ve been back here every year without fail for what’s now become an annual gastronomic pilgrimage I simply can’t get by without. A proper crawl through the Pintxos hotspot of the Old Quarter is of course a must on any San Sebastian itinerary (I’ve covered Pintxos culture and some of my favourite bars in Parte Vieja extensively in a previous post here). However, the more I revisit San Sebastian and explore its lesser known neighbourhoods, the more I realise there’s more to the city’s Pintxos scene than the jam-packed bars of the Old Quarter. And in my mind, there’s no better alternative to Parte Vieja than the adjacent district of Gros to sample these little, bite-sized works of art. A short walk east across the Kursaal or Santa Catalina bridges from Parte Vieja, the Pintxos bars of Gros offer a much more laid back and local experience. Not only does the food rival that of the Old Quarter but you will have pleasure of meeting some of the friendliest locals and barmen around. On top of that, with Pintxos dishes and wines by the glass typically 10-20% cheaper than their counterparts in Old town, you get incredible value for money here. Here are 3 of my favourite Pintxos bars in Gros for those of you looking to escape the crowds of Parte Vieja and crawl a little bit off the beaten track in San Sebastian. My favourite Pintxos bar in the Gros area, Hidalgo 56 dishes up some of the tastiest and most creative Pintxos in town. Their Morcilla ‘volcano’ is one of the dishes I crave most as soon as I set foot in San Sebastian. A house speciality made from black pudding, egg yolk & apple puree, it’s an explosion of bold, earthy and moreish flavours from the get go. For something a bit more delicate and fresher on the palate, try their Tomato & Anchovy Tartare. A must-visit on any Pintxos crawl itinerary in the Gros district. Spacious, welcoming and with a huge variety of hot and cold dishes to choose from, Casa Senra is one of the Gros district’s most classic bars. Make sure you order their signature baby squid dish (Txipiron plancha con pure castana). Chargrilled to smoky perfection and served with squid ink sauce, crispy squid ink and a sweet, earthy chestnut puree, it’s a stunning dish that will give even the best dishes in Old Town a run for their money. The wide range of Croquetas are also a must – their classic Croqueta de Jamon is one of the best I’ve tasted in all of San Sebastian. You will be hard-pressed to find a crisper, meatier and creamier croquette elsewhere. This buzzing corner lot in the heart of Gros sports a modern, newly refurbed white counter-top and ample seating. Hand-sketched designs on the back wall and a friendly pictorial menu give a preview of the many hot and cold Pintxos on offer here. The star dish here is undoubtedly their Txalupa – a puff-pastry ‘boat’-shaped case topped with creamy mushrooms, shrimp and gratinated cheese. I also particularly love their Pintxos-sized serving of Fideua here. Typically a main course found in the Catalan and Valencian regions, the characteristic short noodles are cooked in the most flavoursome of seafood stocks and served in a rather clever, vintage tin can. It’s so incredibly moreish you’ll be ordering seconds form the barman in no time. 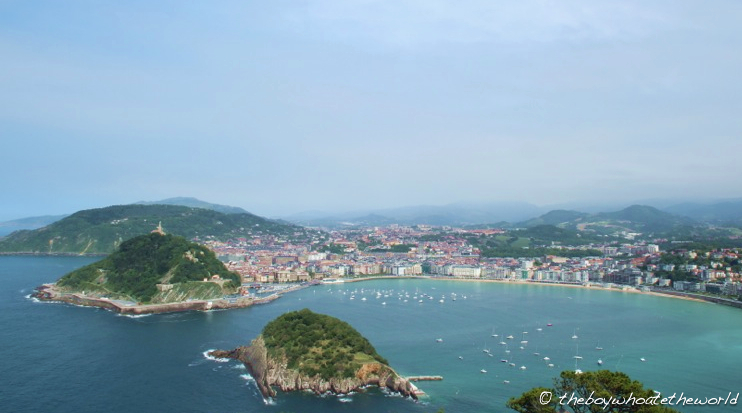 I’m already counting down the days to next year’s San Sebastian trip…. I am sooo glad I came across your blog! Staying in the Old Town but went to Gros last night and I must say it’s so much nicer. No tourists. Fantastic food. What’s not to like?! I sampled the volcano last night. Absolutely delicious. Going back tonight to visit the other places from your list. @Bee: Yes, its a much more local feel in Gros isn’t it! Glad you are enjoying San Sebastian. I’m planning on going back sometime later this year for my annual visit!